SIGGRAPH Asia 2014 will be held in Shenzhen. Download the Digital Library Mobile App and have the SIGGRAPH Asia conference program at your fingertips! Speakers, be prepared for your presentation at SIGGRAPH Asia 2014. Find out important information here. Transportation Tips SIGGRAPH Asia 2014 will be held in Shenzhen. Digital Library Mobile App Download the Digital Library Mobile App and have the SIGGRAPH Asia conference program at your fingertips! Speakers Preparation Information Speakers, be prepared for your presentation at SIGGRAPH Asia 2014. Find out important information here. Announcing the Emerging Technologies Prize Winners Best Demo Prize Voted by Audience and the Best Demo Prize Voted by Committee. 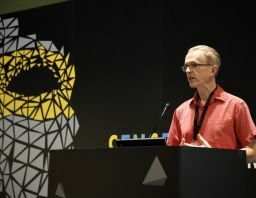 From 3 to 6 December 2014, Shenzhen Convention and Exhibition Center (SZCEC) was transformed into a hub of digital innovation as leading computer graphics and interactive techniques pioneers convened at SIGGRAPH Asia 2014. Online Registration closed on the 20 November 2014. You can still register onsite at the event at onsite registration rates. If you need your registration confirmation letter, please log-in here. Our early bird registration deadline has been extended to 24 October 2014, 15:00 UTC/GMT +8 (Shenzhen, China time). If you haven’t registered for SIGGRAPH Asia 2014 yet, do so today to enjoy up to 20% off registration prices! A preview to some of our speakers and a rundown of the Business Symposium are now available. Click here to read more. Check online for conference program updates soon! Calling all exhibitors: Participate with us and meet with Asia's industry leaders in Shenzhen to build valuable business connections. Early bird discounts available till 1 August 2014. Find out more! The Calls for Submission for all SIGGRAPH Asia 2014 programs are now open. Click here for more details.